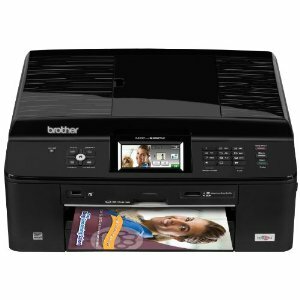 Compact and easy-to-use, this All-in-One with unique decorative lid and print, copy, scan and fax features is ideal for the small or home office. Share with multiple computers on a network using the wireless (802.11b/g/n) or wired Ethernet connection. The 3.3" Touchscreen color LCD display is perfect for interactive and easy to use menu navigation. Access your Facebook, Picassa photo organizing software, Flickr, Google Docs and Evernote accounts via the Web Connect Touchscreen Interface. Print directly on printable blank DVDs, CDs and Blu-ray discs for personalization. Help save paper with automatic duplex (2-sided) printing. Unattended fax, copy and scan up to 20-page documents using the automatic document feeder. Fast print speeds of 35 ppm black/ 27 ppm color (Fast mode); ISO-based 12 ppm black / 10 ppm color (ISO/IEC 27434).